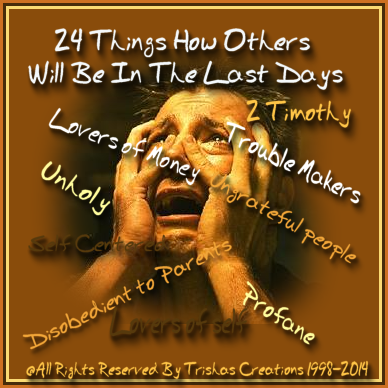 "24 Things How Others Will Be In The Last Days"
Welcome to "24 Things How Others Will Be In The Last Days"
One thing I seem to have a problem with, and that is those which think just because they believe in the Lord Jesus Christ and they live wrong, and curse, lie, steal and cheat and fornicate, and drink, and cares for money and love and worry about themselves, they think God is going to be pleased enough with them that they will be able to see "Jesus" and their loved ones. Everyone, can believe in the "Son of God" and believe that Jesus died on the cross and shed his blood, but if their hearts are not right with Him, they will not be able to see Heaven, they will be lost. And, why would God want those kinds of people in Heaven, that only care for themselves and are workers of iniquity? I have listed some things below, which will show some things and ways people will be in the end times, and we are definitely in the end times and Jesus is soon Coming!